At both St Michael's and St Peter & St Paul's we are always happy to receive requests from people who live in our parishes to Christen their children. At a Christening your child will be baptised in the name of the Father, the Son and the Holy Spirit and through that baptism become part of the world wide Church, which is the Body of Christ. To learn more about Christenings in the Church of England, click here. If you live in Kingsteignton, St Michael's is your Parish Church. 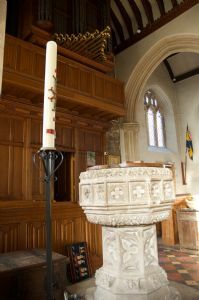 We normally conduct Christenings at St Michael's 12.30pm on a Sunday. If you live in Teigngrace, St Peter & St Paul's is your Parish Church. Again, we normally conduct Christenings here at 12.30pm on a Sunday, as well. If you're not sure which of these two parishes it is within which you live, please be in touch with us and we will let you know. We are also very happy to talk to any resident of our parishes who is interested in receiving adult baptism within the Church of England. For all enquiries about Christenings at St Michael's, Kingsteignton, or St Peter & St Paul's, Teigngrace, please contact Fr Mark on 01626 355127, or click here to e-mail us.